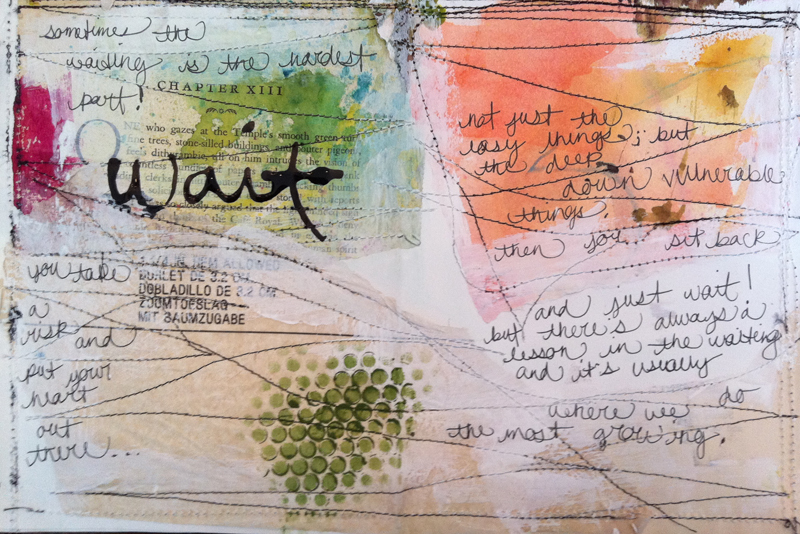 journal entry: sometimes the waiting is the hardest part! you take a risk and put your heart out there… not just the easy things, but the deep down vulnerable things. then you sit back and just wait! but there’s always a lesson in the waiting and it’s usually where we do the most growing. materials used: found and painted papers, stitching, acrylic paint, gesso, pen, acrylic ink, shiva paintstiks. “there’s always a lesson in the waiting” I have found that to be true as well. Beautiful post. All things come to those who wait. 🙂 Gorgeous work of art and a solid message to go with it. Beautiful! Wendy I have to tell you that I just LOVE your art journal pages. Everytime I see one in my blog list I click straight away. Such talent!! thanks so much for stopping by tell me. love to you. i am too in such a room. here if we let it. it is sometimes not the easiest place to be for sure. you have to enjoy the process and the journey. i do have a button on the right side of my blog.